Repair Dry Winter Skin Fast! When winter hits...it hits hard and brings with it dry winter skin! Many cases of cracked, red and dry skin are a direct result of the harsh winter weather. The proper skin care is essential to repair and restore your skin back to a healthy and balanced condition. Dry winter air can cause your skin to crack, chafe, itch and develop dry patches as well as red and inflamed skin. During cold spells, your skin is constantly bombarded, dried out, and increasingly susceptible to infection. Central heating of home and other buildings is also very drying to the skin. Driving in a heated car, bus or train often compounds this problem. Unfortunately, many people neglect their skin, or only treat it for cosmetic reasons. It's critically important to remember that our skin is an organ, part of the body just like anything else, and requires constant care. It's best to start taking care of your skin early in the winter, before dryness has a chance to set in. Simple daily routines, such as bathing and towel drying, may actually remove moisture from the skin adding to dry winter skin. Modifying your bathing routine will help preserve your skin's moisture. Bathing provides the skin with moisture temporarily, but removes the skin's oily lipid layer and in the long run causes more moisture loss than gain. Deodorant soaps are often very harsh and drying. The wrong moisturizing lotion can have the same effect. 1) Each day when you take your bath or shower, try to use lukewarm water. Hot water dries out the skin. Try to limit your time to fifteen minutes or less in the bath or shower so as to not diminish your skin's natural oils. 2) Don't use harsh soaps or cleansers, which contain preservatives, fragrances and lye that can irritate skin. Wash with only with a "non-soap" cleanser that is hypo-allergenic and contains only herbal ingredients that are organically grown. 3) Avoid vigorous use of a washcloth in cleansing. When toweling dry, do not rub the skin. Blot or pat dry so there is still some moisture left on the skin. 4) Next apply a moisturizer to the skin. The best time to do this is immediately after a bath or shower so that the moisturizer holds in the moisture from the shower. Lotions and creams create a barrier that protects your skin against dryness. There are several factors to look for in a proper and effective moisturizer. It should be formulated to be hypo-allergenic, contain NO fragrance, dyes, mineral oil, petroleum or harsh steroids . The "right" therapeutic cream for should be formulated to be hypo-allergenic and filled with only the best and healthful ingredients! This type of skin treatment will then be suitable for infants, children and adults experiencing dry winter skin problems. Vitamins and herbal extracts promote restoration and proper skin tone and health. One of the main ingredients should include urea . This is a powerful “humectant” and actually unpacks dry, damaged cells 7 layers deep and binds water below the surface of the epidermis, right down to the stratus corneum, which is the skin building layer, allowing your sensitive skin to repair. You see, only natural products are designed to truly soothe dry winter skin and bring relief and balance to parched, itchy, red and cracked skin of all types. 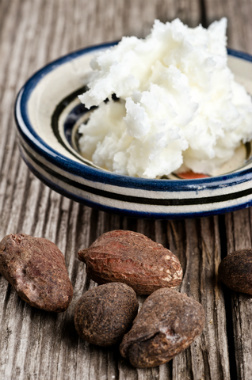 Healthful vitamins and herbal botanicals as well as the super moisturizing ingredient – shea butter - produce fast and highly effective results. This combination will also provide a protective barrier on your skin to seal in moisture and prevent your skin from drying out outdoors as well as indoors. ** Use a humidifier in your home during the central heating season. If sweating causes itching, modify your activity and surroundings to minimize sweating. Work and sleep in a fairly constant temperature (68-75o F) and humidity (45-55%). ** Remember to keep drinking plenty of water and other liquids to keep your skin moist from the inside, too. Below you will find links to the natural products I recommend that, in my professional opinion, work BEST for dry winter skin.